Scientific research is an important part of the work of modern zoos. One of the most important but generally hidden areas of work in the Bird Garden is research; projects are managed by the Bird Garden Curator, and are carried out by staff and university students, on several important conservation bird species, such as the Humboldt Penguins, Chilean Flamingos or Ross’s Snow Geese. Undergraduate or post-graduate students from several universities either undertake research projects or do short and long term work placements. The results benefit the birds at Harewood and also in other collections. Biologists and zoologists working at Harewood have been able to uncover and note all kinds of useful information that has advanced our understanding of birds and our future conservation work. Research work helps us improve the management of birds in the garden, by removing stress, enriching their environment and managing reproduction and diets. 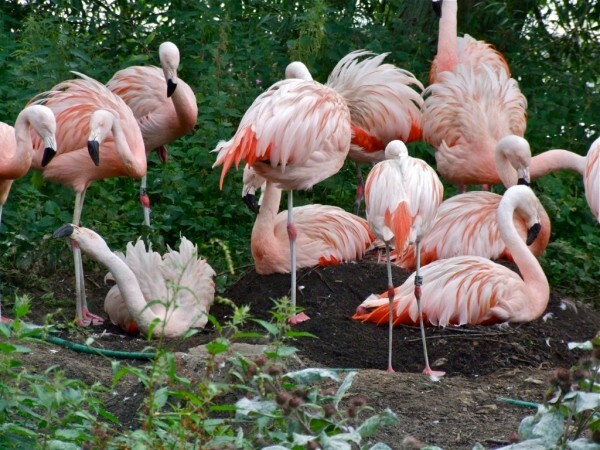 Habitat and enrichment changes in the Chilean Flamingo enclosure have meant the Flamingos have hatched a chick after a gap of 20 years. Diet enrichment has been implemented with our Touracos, who as part of the European Breeding Programme have hatched many chicks consistently over several years. A behavioural study of the Humboldt Penguins means we have introduced an additional afternoon feed for them, and they feed much better at this new time and in a different location. Ultimately, research in zoos and aquariums is driven and governed by one main goal; to gather knowledge that benefits the conservation of threatened species through welfare, education and a good day out.